In preparation for the upcoming Rule 5 draft in December, the St. Louis Cardinals added four minor league players to the 40-man roster. The immediate benefit is to protect the four from being chosen in the Rule 5 draft. The 40-man additions are outfielders Tyler O’Neill and Oscar Mercado and pitchers Austin Gomber and Derian Gonzalez. They bring the 40-man roster up to 39 players. O’Neill came to the Cardinals in July in the trade that sent Marco Gonzales to the Mariners. The 22-year old finished the year with 31 home runs and 96 RBI between the Mariners Triple-A squad and the Cardinals Triple-A Memphis Redbirds. Mercado was drafted by the Cardinals in 2013 as a shortstop. The Florida native was moved to the outfield and took over primary center field duties with the 2017 Springfield Cardinals. Mercado posted a slash line of .287/.341/.428 in Double-A 120 games. Left hander Gomber went 10-7 with an ERA of 3.34 in 143 innings in his second season with Springfield. Gomber was a fourth round pick by the Cardinals in the 2013 draft. Gonzalez, 22, pitched for the A-Advanced Palm Beach Cardinals in 2017. The right hander went 4-7 with an ERA of 4.33 in 18 games. Gonzalez was signed as a non-drafted free agent from Venezuela in 2012. Among the players not protected and thus eligible to be chosen in the Rule 5 draft are infielder Patrick Wisdom and pitchers Daniel Poncedeleon, Matt Pearce, and Trey Nielsen, along with many others. As the National Baseball Hall of Fame ballot for 2018 was made public this past Monday, three former Cardinals made their first appearance – pitchers Chris Carpenter and Jason Isringhausen, and third baseman Scott Rolen. The former has been inducted into the team Hall of Fame with the latter two having appeared on the ballot. Along with Carpenter, Isringhausen, and Rolen, former Cardinal Larry Walker is up for consideration for the eighth year. Also on the ballot is Jamie Moyer, who made eight appearances for the Cardinals in 1991. Carpenter was signed as a free agent by the Cardinals in 2002 after pitching for the Toronto Blue Jays, who drafted him in 1993. Carpenter was granted free agency in 2013 and then retired. The right handed pitcher missed the 2003 season due to injury, then went on to pitch for nine seasons with the Cardinals. Carpenter won the Cy Young Award in 2005, and finished in the top three for the honors in 2006 and 2009, and had a record as a Cardinal of 95-44 with an ERA of 3.07. Isringhausen pitched seven seasons for the Cardinals, from 2002 to 2008. The reliever was signed by the Cardinals as a free agent in 2001. Isringhausen is the franchise all-time saves leader with 217, and topped the 2004 NL with 47. The latter tied Lee Smith for the team record, since passed by Trevor Rosenthal in 2015. Rolen was acquired by the Cardinals in a mid-season trade with the Phillies in 2002. The third sacker played during six seasons with St. Louis, appearing in five All Star games, and winning four Gold Gloves and one Silver Slugger as a Cardinal. Rolen batted .286 and had 111 home runs and 453 RBI with the club before he was traded to the Blue Jays in 2008. The Hall of Fame voters, members of the Baseball Writers’ Association of America with at least 10 years of experience, have until the end of the year to submit their ballots. The results will be announced on January 24, 2018. Derrick Goold of the Post-Dispatch writes that in addition to Giancarlo Stanton (for whom the Cardinals reportedly made a formal offer to acquire), the team has also expressed interest in two other Marlins outfielders, Christian Yelich and Marcell Ozuna. Goold reports that the Cardinals are also interested in free agent first baseman Eric Hosmer. 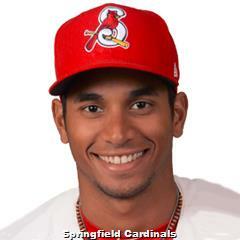 11/20 The Cardinals selected the contract of OF Oscar Mercado from the Springfield Cardinals. 11/20 The Cardinals selected the contract of RHP Derian Gonzalez from the Palm Beach Cardinals. 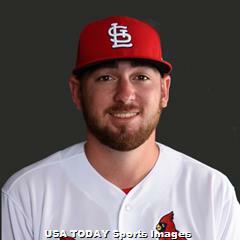 11/20 The Cardinals selected the contract of LHP Austin Gomber from the Springfield Cardinals. 11/20 The Cardinals selected the contract of RF Tyler O’Neill from the Memphis Redbirds. The Cardinals have finalized the 40-man roster for the upcoming Rule 5 draft and have one open roster spot that could be used to select a player. The Rule 5 Draft will take place on December 14, the final day of the Winter Meetings. The Winter Meetings begin on December 10, and will be held in Orlando Florida. The deadline for teams to tender contracts to pre-arbitration and arbitration eligible players is December 1. 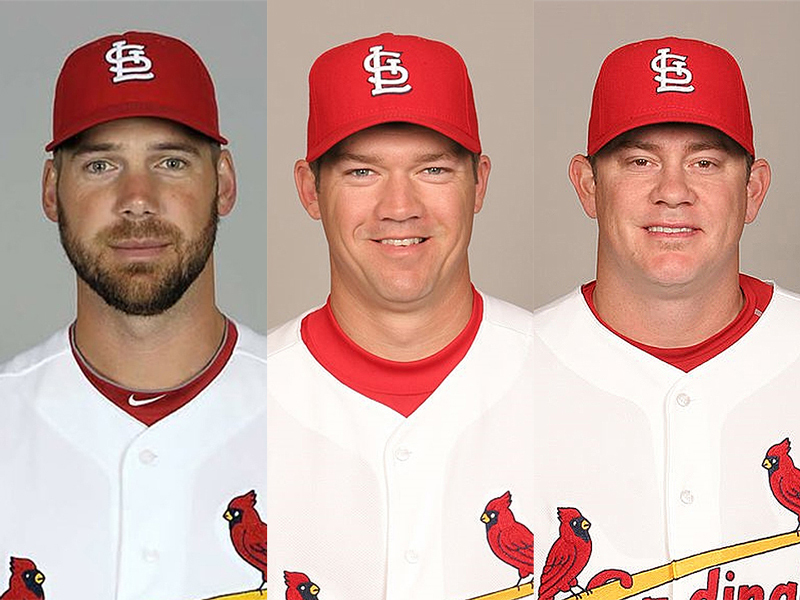 The Cardinals have three arbitration eligible players – Michael Wacha, Tyler Lyons and Randal Grichuk. All should be tendered, though all may not remain with St. Louis for 2017. Grichuk has been rumored to be involved in trade talks. This week’s history segment covers the 1949 St. Louis Cardinals. The 1949 season ended a decade in which the club won four NL pennants and three World Series Championships. It was the 58th season of the franchise as recognized by the club. St. Louis finished the 1949 season in second place in the National League with a record of 96-58. The Cards came in just one game behind the Dodgers after losing the lead on September 29. The manager that season was Eddie Dyer, who led the club from 1946 to 1950. Dyer had been a Cardinals pitcher from 1922-1927. The general manager in 1949 was William Walsingham Jr. and the owner was Fred Saigh. The Opening Day starters for the 1949 season were Del Rice (C), Nippy Jones (1B), Red Schoendienst (2B), Marty Marion (SS), Tommy Glaviano (3B), Stan Musial (CF), Ron Northey (RF), and Enos Slaughter (LF). The longest losing streak was four games, from Sept. 27 to Oct. 1. The longest winning streak was nine games, from July 20 to July 30. The largest winning margin was 14-1 defeat of the Brooklyn Dodgers on July 24. The worst loss was to the same Brooklyn Dodgers on Sept. 22, a drubbing of 19-6. Home/road splits were 51-26 at home, and 45-32 on the road. The top starting pitcher was Howie Pollet, who forged a 20-9 record and an ERA of 2.77. All five starters posted ERAs under 4.00. The best offensive performer was Musial, who batted .338 with 36 home runs and 123 RBI. He and Slaughter came in second and third, respectively, in the NL Most Valuable Player voting, won by Jackie Robinson. 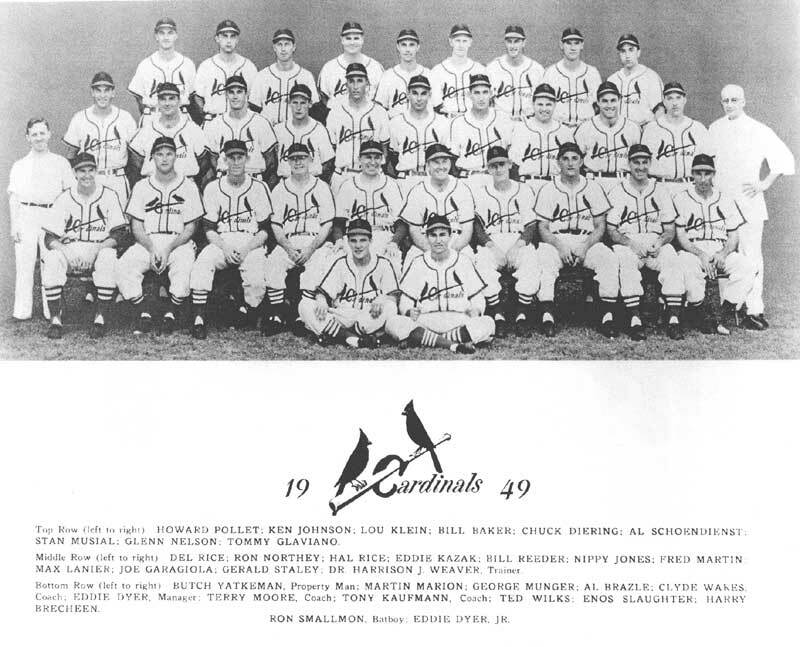 Other notable players who played on the 1949 squad were Joe Garagiola, catcher and future broadcaster, and Solly Hemus, who would become the Cardinals manager from 1959-1961.